A lucky travel agent and a companion will be vacationing on some sun-splashed Florida beaches, thanks to The Beaches of Fort Myers and Sanibel, WestJet and The Outrigger Beach Resort. The destination, carrier and the resort are together offering a prize that includes return travel from Toronto with WestJet, as well as four night’s accommodations courtesy of the Outrigger Beach Resort. Travel must be taken between May 15 and Dec. 15, subject to availability. Blackout periods may apply, and taxes and surcharges are not included. Those entering the contest must answer this question – You can find more than 400 species of what? – online at http://promo.baxter.net/contest/ftmyers.asp. For the answer, see the April 5 issue of Travel Courier. The deadline for entries is May 15. The Beaches of Fort Myers and Sanibel have more than 50 miles of unspoiled beaches, 590 miles of shoreline, more than 100 barrier and coastal islands to explore, award-winning island resorts, idyllic weather, 190 miles of kayaking and canoeing, outdoor adventure, fascinating attractions and outstanding dining. A tropical paradise awaits visitors at The Outrigger Beach Resort. Located on picturesque Fort Myers Beach, the family friendly hotel greets guests with outstanding service and a vibrant Polynesian flair. Guests can enjoy comfort, value and good old-fashioned fun throughout the resort, from the 144 guest rooms to the two on-site restaurants and the beachside Tiki Bar, which features live music daily. 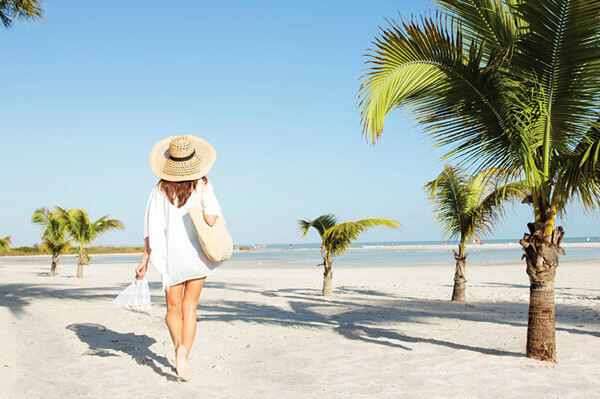 With the beach right on the resort’s doorstep, guests and their families have plenty of fun things to do like collecting seashells, sunbathing, water sports, or even watching pods of dolphins frolic in the warm Gulf of Mexico waters. It also offer easy access to all the activities and attractions of nearby Fort Myers, Naples and Sanibel and Captiva Islands. ‹ The Journey Starts Now!